Gerry Rafferty died today at the age of 63 years old after "a long illness." While the name doesn't ring a bell with many people under the age of 40, I guarantee they've all heard his distinctive voice. I know my kids have. He sang lead on Steelers Wheel's 1972 hit "Stuck In The Middle With You," which of course later went down in cinema history in the famous ear-cutting scene in Quentin Tarantino's 1992 film "Reservoir Dogs." 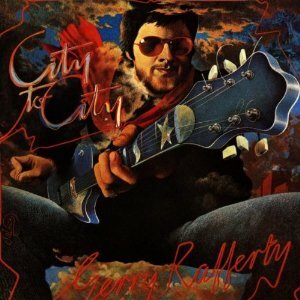 It wasn't until 1978 that Rafferty achieved his biggest success, the City to City album, which contained several huge hits, but nothing compared to the impact of his "Baker Street" single. The late 70s was a fruitful period for English singer/songwriters whose sophisticated tunes were carried away by equally imaginative hometown producers. In the hands of mega-producer/engineer Alan Parsons, folkie Al Stewart went through the roof with "Year Of The Cat," "On The Border" and "Time Passages," all elaborately orchestrated productions. Rafferty followed the same blueprint with City to City, except with a slightly more Scottish flavor. Each song was at least five minutes long, little detailed stories of English lives, and you could best describe them as "sophisticated English folk pop." Producer Hugh Murphy supported each one with the best UK studio musicians, impeccable arrangements, and a warm, homey analog flavor. "Baker Street" was the album signature song, with a killer saxophone hook that just echoed on and on. Trust me when I say that "Baker Street" was played on every radio station morning, noon, and night. This was another one of those songs where the lyrics were desolate while the melody was deceptively upbeat and happy. While "Baker Street" cleaned up, there were two other singles from the album, "Right Down The Line" and "Home And Dry" which hit the Top 40. I was a big fan of the first song, "The Ark," probably because it was atypically slow for an album opener, as well as the title "City to City" cut because nothing beats a good train song. Rafferty never achieved anything close to this kind of success again and eventually faded from sight. He showed up on Mark Knopfler's beautiful soundtrack score to "Local Hero." For some reason, I remember reading an interview with him sometime in 2010 -- still as crusty as ever, railing against the recording industry -- but anxious to release more music. Below are a few videos of Rafferty's hits from City to City -- "Baker Street" in its 4-minute form (originally 6 minutes on the album), "Right Down The Line" and "Home And Dry." Enjoy them -- Rafferty's best gleaming moments in music that he gave us. I loved that City to City LP. I'm sorry to hear that Rafferty died. And pretty young too. Sad.